Of course, when you’re looking for an online casino, you’re looking for the classic casino games such as slots and video poker. Well, Sloto Cash Casino doesn’t disappoint you in that area. They’ve got a good list of slot games for you to choose from, whether it’s a multi-line slot machine you’re looking for or the simple, yet fun classic three-reel slot machines. The games you can find in Sloto Cash Casino are powered by Real Time Gaming, so you can expect quality gaming and of course, brilliant graphics and cool sounds. 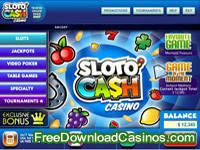 You’re sure to get a kick out of playing at Sloto Cash Casino. Well, to tell you the truth, there are other casinos that offer better bonuses than Sloto Cash Casino. But seriously, it isn’t that much of a bother since the bonuses at the casino are still pretty decent. You can avail for a no deposit cash bonus once you sign up, which is pretty neat if you ask me. That way, you can go ahead and try out the games without spending a single dollar on the casino. Of course, once you get that feel of the casino and if ever you like it, you can choose to deposit in order to get your winnings from them. The bonuses are pretty average. You can get a 400% bonus on your first deposit up to $600, a 200% bonus on your second one up to $500, and a 200% up to $400 on your third. Aside from that, you can get other promos and bonuses as well, such as monthly reload bonuses, some Sloto Tickets, 5% cash back on your losses within 1 month and so on. You can choose from a variety of payment methods in the casino. They support Credit Cards, Neteller, MyPaylinQ, EcoCard, MyPaylinQ, Moneybookers, Wire Transfer, Bank Draft and so on, which is a pretty good range of choices. One thing really great in Sloto Cash Casino is that they accept players from the US. So, if you’re tired of casinos banning your IP address, then this casino will welcome you pretty well.